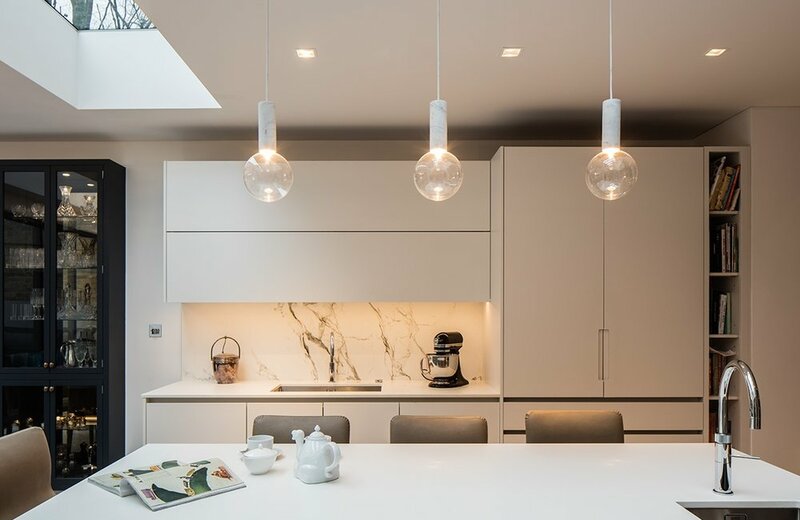 WOOLF collaborated with 23 Architecture on the this chic and innovative refurbishment and extension of this classic Victorian terrace residence. 23 Architecture undertook all the architectural aspects of this project including the exterior, the ground floor and roof extensions, the spacial architecture, layout manipulations, kitchens and bathrooms, with WOOLF undertaking FF&E. This project includes a breathtaking double height gallery space and rear extension creating an open living space and large kitchen. The gallery is surrounded by a glass balustrade, which is juxtaposed by the bare brick chimney breast. The plaster has been stripped back to reveal the edgy red brick, which makes a central focus in the space. A dropped cluster pendant acts as an impressive feature of beautiful glass droplets which delicately fills the space. The palette is sophisticated with an emphasis on glass pendants. Luscious velvet fabrics and metallic faux leather were used in the reception room and luxurious drapes in the master bedroom. Tailored bespoke pieces were made for this project including a beautiful hammered brass base 10 seater dining table with an oval granite top. The dressing table presents a bespoke finish tailored to a specific hospitality-based design.